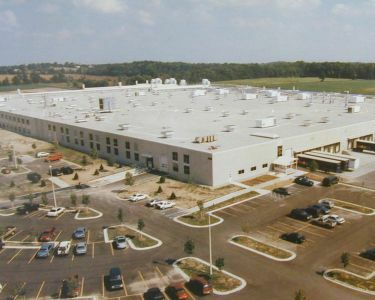 The Steelcase Wood Furniture plant in Grand Rapids, MI, was the very first manufacturing facility ever certified by the U.S. Green Buildings Council (USGBC). This leading global manufacturer of office environment systems shaped design and construction of the new plant to meet specific energy-conservation and environmental-preservation objectives. AbsolutAire was selected to provide advanced heating and ventilating solutions for optimum air-management quality. The fine wood products require precise temperature and humidity control to maintain high-quality manufacturing. The AbsolutAire R-series units not only help to ensure consistent manufacturing conditions, they also help to ensure energy conservation with an almost 100% burner efficiency and reduced fan horsepower requirements.